This fact is becoming more obvious in our observation of soon-to-be 1.5-year-old Bubbles. She learnt a couple of words during her recent hospital stay just by being there. Most notably, she now says doc ta (doctor), nurse, and (to our dismay) dun wan (don't want). Dun wan was a term she learnt from an older boy at the next bed. The poor thing had fractured his elbow and spent most of the time there declaring dun wan for any medication or food he didn't like :( After about half a day, Bubbles started to repeat after him. Now, she says Dun Wan! in addition to her usual No No! for added emphasis. Ah well! 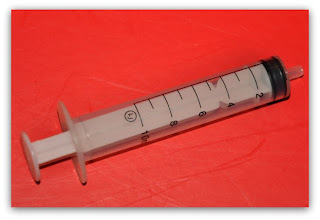 This, for the uninitiated, is one of those syringes that come with kids' medication. It is a washed and clean one that was lying around the house. It does however, look suspiciously like something one uses to poke a patient with in the hospital. It must have seemed so to Bubbles because my mother saw her using it to poke at the back of her hand! haha... Bubbles catch-up the "dun wan" so fast huh! What a coincident, your bubble is about same age as my boy...! Except that you have more than 1! :) More experienced than newbie me.